Milton is a town in Norfolk County, Massachusetts, United States and part of the Greater Boston area. The population was 27,003 at the 2010 census. Milton is the birthplace of former U.S. President George H. W. Bush and architect Buckminster Fuller. Milton also has the highest percentage of residents per capita citing Irish heritage of any town in the United States; 38%. In 2007, 2009, and 2011, Money Magazine listed Milton 7th, 5th, and 2nd, respectively, on its annual list of the "Best Places to Live" in the United States. Template:Very long section Milton was settled in 1640 as part of Dorchester. Referred to as "Unquity", the term used by the Neponset Tribe of the Massachusetts Indians meaning "Lower Falls," which was translated into "Lower Mills" after the establishment of the Stoughton Grist Mill in 1634. 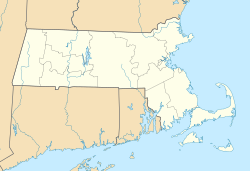 In 1662, "that part of the Town of Dorchester which is situated on the south side of the Neponsett River commonly called 'Unquatiquisset' was established as an independent town and named Milton in honor of Milton Abbey, Dorset, England." Two royal governors of Massachusetts, Jonathan Belcher and Thomas Hutchinson, had houses in Milton. The Governor Belcher House dates from 1777, replacing the earlier home destroyed in fire in 1776, and it is privately owned on Governor Belcher Lane in East Milton. Although Hutchinson's house is gone, Governor Hutchinson's Field, owned by the Trustees of Reservations today is a wide expanse of greenery on Milton Hill, with a view of the Neponset River estuary and the skyscrapers of Boston six miles (10 km) away. Both Governor Belcher's house and Governor Hutchinson's field are on the National Register of Historic Places. According to the United States Census Bureau, the town has a total area of 13.3 square miles (34.4 km²), of which, 13.0 square miles (33.8 km²) is land and the balance is water. Great Blue Hill in the Blue Hills Reservation is the highest point in Norfolk County, and at 635 feet (194 m), is the highest point within 10 miles (16 km) of the Atlantic coast south of central Maine, making it an important weather observatory and radio and television transmitter site. As of the census of 2010, there were 27,003 people, 9,274 households, and 6,835 families residing in the town. The racial makeup of the town was 77.4% White, 14.3% Black or African American, 0.1% Native American, 4.1% Asian, 0.0% Pacific Islander, 0.6% from other races, and 2.5% from two or more races. Hispanic or Latino of any race were 3.3% of the population. Milton also has been cited as having the highest percentage of residents citing Irish lineage of any town in the United States per capita — 38% — There were 8,982 households out of which 37.5% had children under the age of 18 living with them, 60.1% were married couples living together, 11.9% had a female householder with no husband present, and 24.8% were non-families. 21.2% of all households were made up of individuals and 12.7% had someone living alone who was 65 years of age or older. The average household size was 2.79 and the average family size was 3.27. In the town the population was spread out with 25.8% under the age of 18, 8.0% from 18 to 24, 25.9% from 25 to 44, 24.1% from 45 to 64, and 16.2% who were 65 years of age or older. The median age was 39 years. For every 100 females there were 89.7 males. For every 100 females age 18 and over, there were 84.2 males. There are six public schools in Milton, including four elementary schools: Collicot, Cunningham, Glover, and Tucker; one middle school, Charles S. Pierce; and the Milton High School. There are also private high schools and elementary/middle schools, including the girls' school Fontbonne Academy, St. Mary of the Hills, St. Agatha's, Thacher Montessori School, and Delphi Academy. Milton is also one of the few school systems which offer a French immersion program, starting in Grade 1. For those students that participate in this program, all classes are taught in French during grades 1 and 2, allowing children to become fluent in this language. In grades 3 - 5, some classes are taught in English as well to prepare for the MCAS. This program continues through grade 12. Spanish/English is taught as well. In the middle school Latin is available for the Spanish/English students. Stephen Davis, music journalist and biographer. John Murray Forbes, American railroad magnate, merchant, philanthropist and abolitionist. Robert Bennet Forbes, Sea captain, China merchant, ship owner, and writer. Jenny Slate, comedian on Saturday Night Live. ^ "Monthly Averages for Milton, Massachusetts". Weather.com. 2010. http://www.weather.com/weather/wxclimatology/monthly/graph/USMA0260. Retrieved 2010-03-31. ^ "Climatological Information for Milton, United States". Hong Kong Observatory. http://www.hko.gov.hk/wxinfo/climat/world/eng/n_america/us/milton_e.htm. Retrieved 2011-12-10. ^ a b Marquard, Bryan (2010-06-22). "John Ferruggio, at 84; hero of 1970 Pan Am hijacking". Boston Globe. http://www.boston.com/bostonglobe/obituaries/articles/2010/06/22/john_ferruggio_of_milton_hero_of_1970_pan_am_hijacking_dies_at_84/. Retrieved 2010-06-27. ^ Holoman, D. Kern (2012). Charles Munch. Oxford University Press. http://books.google.com/books?id=2TArRS9WZwkC&lpg=PA98&ots=_RQGCejrBB&dq=charles%20munch%20milton%20ma&pg=PA100#v=onepage&q=charles%20munch%20milton%20ma&f=false. "Milton (Massachusetts)". New International Encyclopedia. 1905. Chisholm, Hugh, ed (1911). "Milton (Massachusetts)". Encyclopædia Britannica (11th ed.). Cambridge University Press. This page uses content from the English language Wikipedia. The original content was at Milton, Massachusetts. The list of authors can be seen in the page history. As with this Familypedia wiki, the content of Wikipedia is available under the Creative Commons License.